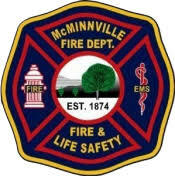 The Amity fire district partners with the McMinnville fire department to provide an ambulance staffed with an EMT and a Paramedic with a full compliment of advanced life support equipment and supplies. During the week the ambulance is staffed between the hours of 8 am and 5pm and is housed in the Amity fire district head quarters located within the city limits of Amity. After hours and on weekends we maintain the same partnership and same level of service however the ambulance responds directly from Mcminnville. The Amity Fire District provides a blood pressure check service free of charge to anyone in need. All you have to do is stop in the Main station at 700 south Trade street in Amity during regular business hours and ask if some one could take your blood pressure. if not on a call Any one of our highly qualified personnel would be happy to assist you. In addition to the Advanced life support ambulance Amity district has many volunteers that are trained to the EMT and EMR level and can provide the needed level of care while the ambulance is responding.